MINNEAPOLIS – May 16, 2017 – Restaurant Technologies is delighted to announce its 25,000th customer, Loyola Marymount University (LMU) and Sodexo, two organizations that share the same passion for delivering high-quality foods to their customers and are committed to smarter operations that are sustainable. LMU, a private university located in Los Angeles, Calif., offers 16 on-campus dining facilities, operated and managed by Sodexo, world leader in Quality of Life Services. 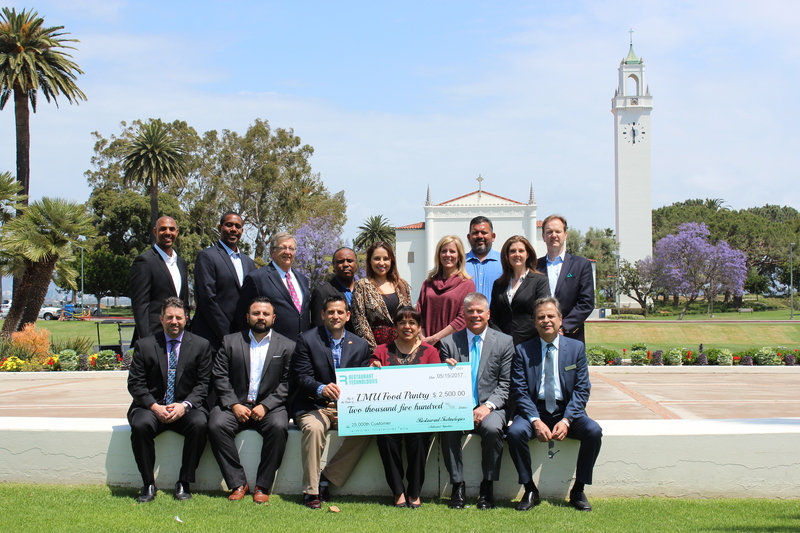 This landmark partnership was formalized May 15 on Loyola Marymount’s campus, where Restaurant Technologies, in celebration of Sodexo at LMU being the 25,000th customer, donated $2,500 on their behalf, to the LMU Food Pantry, a resource that offers food to any LMU student who may experience food insecurity due to financial hardships. Sodexo has a strong commitment to ending hunger as demonstrated by the efforts of its dedicated employees and through Sodexo’s Stop Hunger Foundation, an independent entity that provides meals to people in need and serves as a leading force in the fight against hunger. In an effort to satisfy a range of palates and compete with off-campus dining options, universities are working to expand the entire campus dining experience to offer diverse, health-conscious meals that require cleaner, and fewer, ingredients. LMU and other universities have seen the benefits of using innovative equipment, such as Restaurant Technologies’ Total Oil Management system, to deliver a higher quality food product to keep students satisfied. Oil management is a dangerous, labor-intensive job, which is why institutions including Liberty University, the University of Cincinnati, The Ohio State University and Rutgers have also adopted the automated system for handling cooking oil. Restaurant Technologies’ solution eliminates the need for workers to manage fryer oil at any point during the process, which enables operators to maintain the quality of cooking oil and directly impacts the end product. Universities are also seeing the benefits of how the system significantly reduces the packaging and used oil sent to landfills by recycling used oil into biodiesel or animal feed, enabling universities to elevate sustainability efforts to the growing number of students and parents concerned about sustainability. A trusted partner for more than 15 years, Restaurant Technologies is the leading provider of cooking-oil management and back-of-house exhaust cleaning solutions to 25,000 national quick-service and full-service restaurant chains, independent restaurants, grocery delis, hotels, casinos, universities and hospitals. Restaurant Technologies helps food service operators make their kitchens safer, smarter, more efficient and more sustainable through its automated oil storage, handling, filtration monitoring and disposal management systems and AutoMist™ automated exhaust cleaning solutions. Headquartered in Mendota Heights, Minn., Restaurant Technologies is a privately held company, currently operates 40 depots and has more than 800 employees serving customers across the United States. For additional Restaurant Technologies information and news, visit www.rti-inc.com. Follow Restaurant Technologies on Twitter @RTIoil, LinkedIn and Facebook. Loyola Marymount University, the University of Silicon Beach, is ranked in the top 10 percent of higher education institutions nationally by The Wall Street Journal. Founded in 1911, LMU is a Catholic, Jesuit and Marymount university with more than 6,100 undergraduate students and more than 3,000 graduate and law students. LMU offers 58 undergraduate majors and 53 minor programs, along with 46 master’s degree programs, one education doctorate, one juris doctorate, one doctorate of juridical science and 13 credential/authorization programs. LMU’s intercollegiate athletics teams compete in the West Coast Conference with 22 Division I and varsity sports. Sodexo USA is an American business that is part of a global, Fortune 500 company with a presence in 80 countries. Delivering more than 100 services across North America that enhance organizational performance, contribute to local communities and improve quality of life, Sodexo is a leading provider of sustainable, integrated facilities management and food service operations. It employs 123,000 Americans at 12,500 sites across the country and indirectly supports tens of thousands of additional U.S. jobs through its annual purchases of $9.2 billion in goods and services from small to large American businesses. In support of local communities across the U.S., the Sodexo Stop Hunger Foundation has contributed close to $30 million over the past 20 years to help feed children in America impacted by hunger.